There is no other city in Western Australia like the City of Belmont. 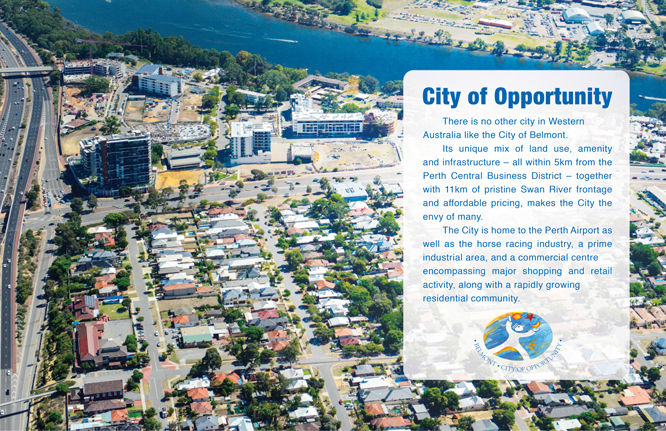 Its unique mix of land use, amenity and infrastructure – all within 5km from the Perth Central Business District – together with 11km of pristine Swan River frontage and affordable pricing, makes the City the envy of many. 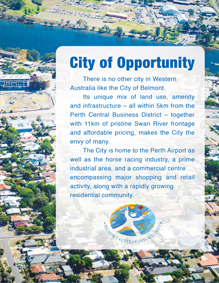 The City is home to the Perth Airport as well as the horse racing industry, a prime industrial area, and a commercial centre encompassing major shopping and retail activity, along with a rapidly growing residential community. With the beautiful Swan River forming one of the City’s main boundaries, the City of Belmont is a truly a riverside City. The past decade has seen unprecedented growth in the City, with significant commercial and residential developments underway or completed. According to City of Belmont Mayor Cr Phil Marks, the City has consolidated its position as one of the State’s most progressive and sustainable local government authorities. “The City of Belmont is currently undertaking a number of significant – potentially life-changing projects,” he said. “These are exciting changes that will see a new Belmont unfold. “Master planning is well underway for the new Faulkner Civic Precinct which will become the civic heart of the City – a precinct that every member of the community can enjoy. The tender for architectural and engineering services for the Community Centre Faulkner Civic Precinct was recently advertised along with other tenders integral to the initial stages of the project. Belmont is a hub of activity. The City enjoys a strong economic position – during 2014-2015 the total gross revenue generated by business in Belmont was $17.8 Billion. According to City of Belmont Chief Executive Officer Stuart Cole, as a financially sustainable local government, the City recognises that effective financial management is one of the most important services that a local government can provide for its residents, businesses, property owners and stakeholders. “I am continually impressed by the dedication of Councillors and staff who together on a daily basis commit themselves to ensuring the best outcomes for the community of Belmont,” Mr Cole said. As the City of Belmont’s Property and Economic Development Manager Jay Hardison says Belmont’s business precinct is less than 10 minutes from Perth CBD. Affordable land and proximity to air, rail and road transport arteries have drawn businesses to the area. “There are also many opportunities to build, develop or lease business premises in Belmont,” Mr Hardison said. “We want our businesses to plan their future in the City with confidence. We want them to feel a key part of the community and to actively participate and work with us to achieve their objectives and ours,” he said. The City currently hosts more than 3000 businesses ranging from home-based operations to multinational headquarters and distribution centres. “We are very proactive when it comes to attracting and retaining businesses and investment. The City offers several programs that work for the benefit of local business, as well as a streamlined approval process for businesses that want to upgrade or redevelop their sites,” Mr Hardison said. The City offers a number of services to the local business community including a quarterly magazine, Belmont Business Talk, dedicated to keeping the business community informed, and access to crime prevention services such as security patrols and the Alarm Assist program. Another unique service provided by the City is BUSlink – a free lunch time shuttle bus service connecting local business workers to Belmont Forum Shopping Centre and major retailers along the route. The City of Belmont supports the Belmont Business Advisory Group (BBAG), a volunteer committee of local business champions, who meet regularly to discuss matters of importance to the business community. The City of Belmont conducts a Community and Business Perceptions Survey annually, the results of which guide the City on how it interacts with the community and delivers services to customers. These results and feedback are considered during the City’s annual review of its Strategic Plan where strategies are put in place to address the key priority areas that have been identified by the local community and businesses. According to City of Belmont Chief Executive Officer Stuart Cole, the City maintains a high level of overall satisfaction. “The City of Belmont continues to set the benchmark in several significant Local Government performance areas,” Mr Cole said. “In 2015, 92 per cent of residents were satisfied with the City of Belmont as a place to live and 88 per cent of residents were satisfied with the City of Belmont as a governing organisation,” he said. “We achieved high scores in a number of other areas highlighting operational strength in providing access to services to our community and facilities for youth, for those with disabilities; library services; Council’s leadership in the community; as well as the City’s communication tools. 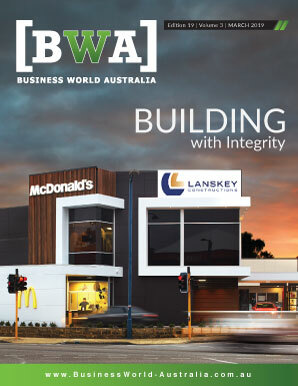 The City of Belmont was identified as an industry leader in 15 business areas some of which included, Council’s leadership, what the City does to promote the area as a desirable place to do business, planning and building approvals, and how the community is consulted about local issues. There are a number of significant major infrastructure and urban renewal projects that are contributing to the transformation of the City of Belmont as it looks towards the future. Some of these projects include The Springs, developed in partnership with Landcorp and the private sector, which involves the redevelopment of 12.5ha of riverfront land into a high-standard, high-density residential and commercial precinct. Another major redevelopment is Development Area 6 (DA6) in Redcliffe. In recent years, the WA State Government committed to implementing a rail service to Perth Airport, which will include the development of a new train station within DA6. The City of Belmont is currently in the planning stages of a major mixed-use development that will take advantage of that opportunity. “Once we have a new train station, we will have a whole new transport-oriented development area with high-density living and a new commercial precinct; that’s going to change the face of that part of the City,” Mr Hardison said. Last year the City secured through the National Stronger Regions Fund, a $6 Million grant for the $12 Million Belmont Business Park Transport Infrastructure Upgrade. Belmont Business Park is set to become one of WA’s most significant business hubs due to its strategic gateway location between Perth CBD, Perth Airport and industrial areas to the south. This unique business precinct is attracting a vibrant mix of innovative businesses and will deliver more job opportunities to meet the needs of the region and provide sustainable transport options for workers and visitors. All these factors augur well for the City of Belmont, according to Chief Executive Officer Stuart Cole. “Looking forward, the City is set to continue delivering excellence in service to our community, while ensuring that we create opportunities for residents, businesses and visitors into the future,” Mr Cole said.